I grew up in Texas and Louisiana. 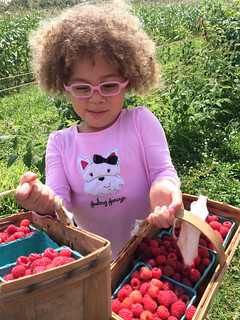 I’m not sure if it’s just not something we did because my parents weren’t into that sort of thing or if u-pick farms weren’t popular back then, but I’ve never been to pick strawberries or raspberries until this summer. I took the babies to the Aufdenkampe Family Farm this morning after the Bee’s swimming lessons. The Beast was calm in the stroller while we picked a while. I had serious flashes to Blueberries for Sal, but the Bee had a great time. She’s an excellent berry picker. We came home with 5 pints in the car and probably another pint or two in our tummies. They were beautiful sweet berries; some of them looked more like strawberries they were so big and beautiful. Of course after getting them home, we had to decide what to do with all of them (other than gorging ourselves). I washed and dried two pints, put them on a cookie sheet in the freezer and now we have a stash of yummy berries. 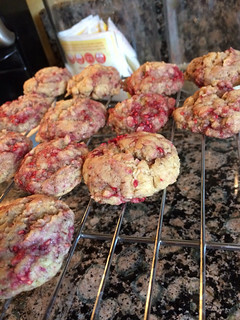 I also found and modified a recipe for Lemon-Raspberry Oatmeal cookies on The Spiffy Cookie. Cream the butter and sugars. Add the flax and orange extract and beat well. Add flour, salt, brewers yeast and baking soda and beat until a soft dough forms. On low, beat in the oats, and then add in the raspberries. Use small cookie scoop to drop on to a greased cookie sheet (or Silpat). Bake for 10-12 minutes, until the edges begin to brown.